large scale Large, dramatic scale, designed for high visual impact in larger areas where viewer is more distant. 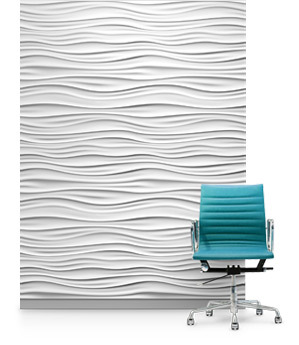 Our panel product is intended for commercial projects or larger spaces. Applications: Commercial locations, large interiors, lobbies, offices, nightclubs, restaurants, retail, hotels, feature walls, etc. Install Summary: Installation Time: Approximate 1 man-hour per panel. Experience may shorten. Panels are screw-mounted through the face to the substrate (typically drywall). All panel-to-panel edges are glued with approved adhesive as panels are mounted. Seams are filled with the approved spackling compound. Surface is sealed with the approved primer/sealer. Finish: Two coats minimum of sealer, one to two of finish paint required (flat finish recommended). Professional paint spray equipment preferred (sealer supplied with install kit). Storage: Limited time in packaging, store in controlled environment. Acclimate to install space for 24 hours prior to install. small scale Smaller shapes, tighter texture, same relief depth. Designed for sculptural drama in more intimate spaces where viewer is in closer proximity. Our tile product is suited for small spaces (areas of about 8' x 12' or less). 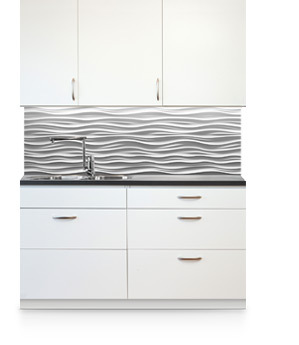 Applications: Smaller spaces, hotel rooms, residences, kitchens, backsplash, small feature walls in intimate spaces. Install Summary: Installation Time: Approximate 1/2 man-hours per tile. Experience may shorten. Tiles are screw-mounted through the two mount-points in the surface (typically direct to drywall). We have a simple method using inserts. All tile-to-tile edges are glued with approved adhesive as they are mounted. Finish: Two coats minimum of sealer, one to two of finish paint required (flat finish recommended). Professional paint spray equipment preferred (sealer available at Home Depot). Packaging: Boxes of twelve. Parcel carriers. Freight typically for 4 or more boxes. Hand truck (dolly) preferred at receiving location for multiple boxes. 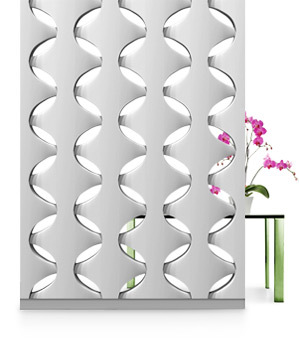 screen wall Large, dramatic scale, designed for high visual impact. Fully dimensional, double-sided. Voids in the design allow some degree of light and transparency through wall. Applications: Blocks become a full height, highly dimensional partition screen wall, either free-standing or abutting existing walls. Commercial locations and dramatic interiors, lobbies, nightclubs, retail, hotels, offices, etc. Install Summary: Installation Time: Approximate 1.5 man-hour per block. Experience may shorten. Blocks are assembled with a standard steel stud and track system. Every two vertical columns of blocks require one footing part, which acts as a base for the blocks, and a face onto which you may apply a desired baseboard or trim. Blocks are glued at the adjoining edges as they are assembled. Seams are coated with the prescribed filler and sanded. Blocks are sealed with the prescribed sealer and finish painted with a color of your choice. Packaging: Wooden crates. Must ship freight. Forklift or pallet jack at receiving location required. Power driver to remove crate screws. Storage: Store in controlled environment. Acclimate to install space for 24 hours prior to install. US & Foreign Patents & Pending Patents | All images © Modular Arts, Inc. | Made in the USA, sans hubris. modularArts and InterlockingRock are registered trademarks of Modular Arts, Inc.